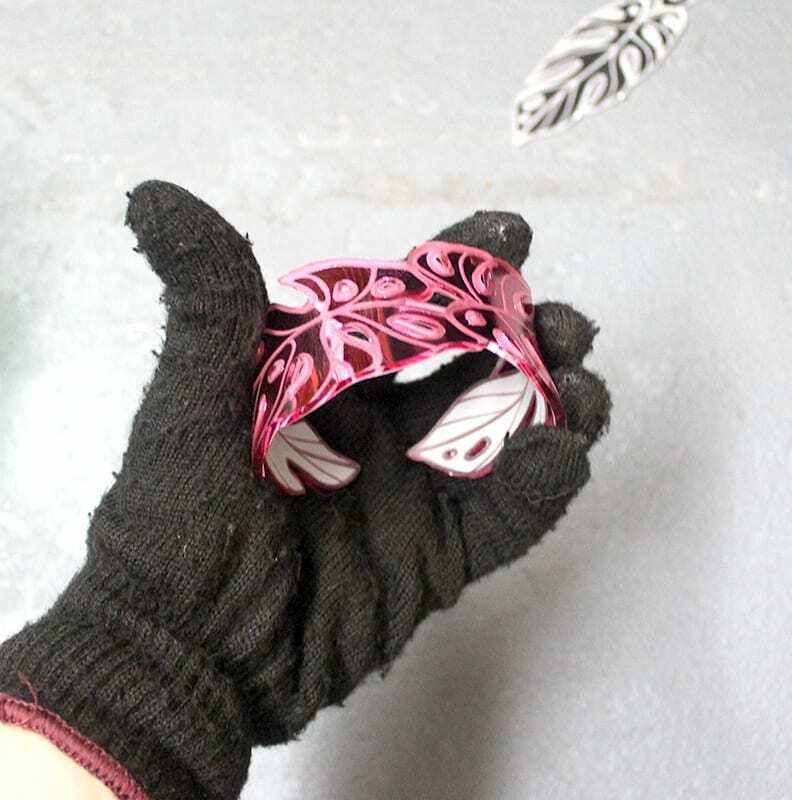 Laser cut pieces to bend (we used this file, which had a 200mm long x 40mm wide leaf shaped band…but you could bend anything! Scroll down for more examples). 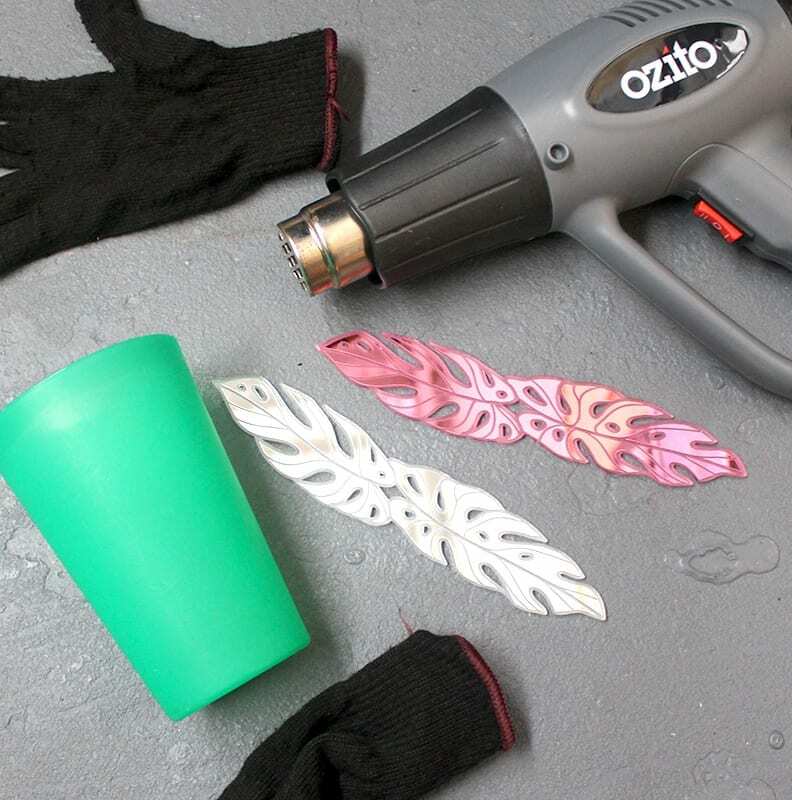 A heat gun (we used this $49 Ozito one). 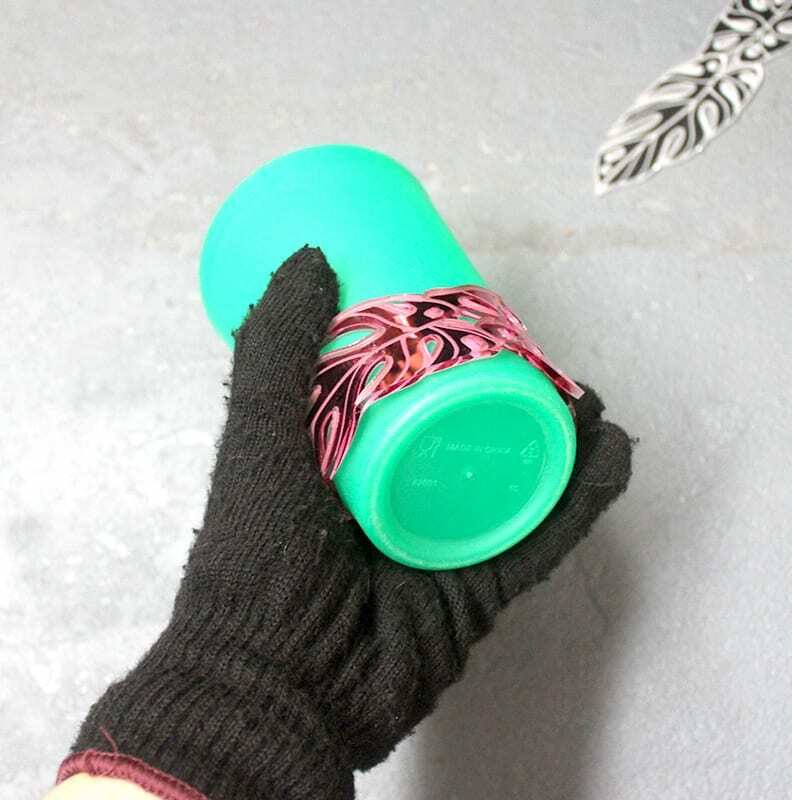 A pair of heat proof gloves (we used our winter gloves). Something to bend around (we used a plastic cup). 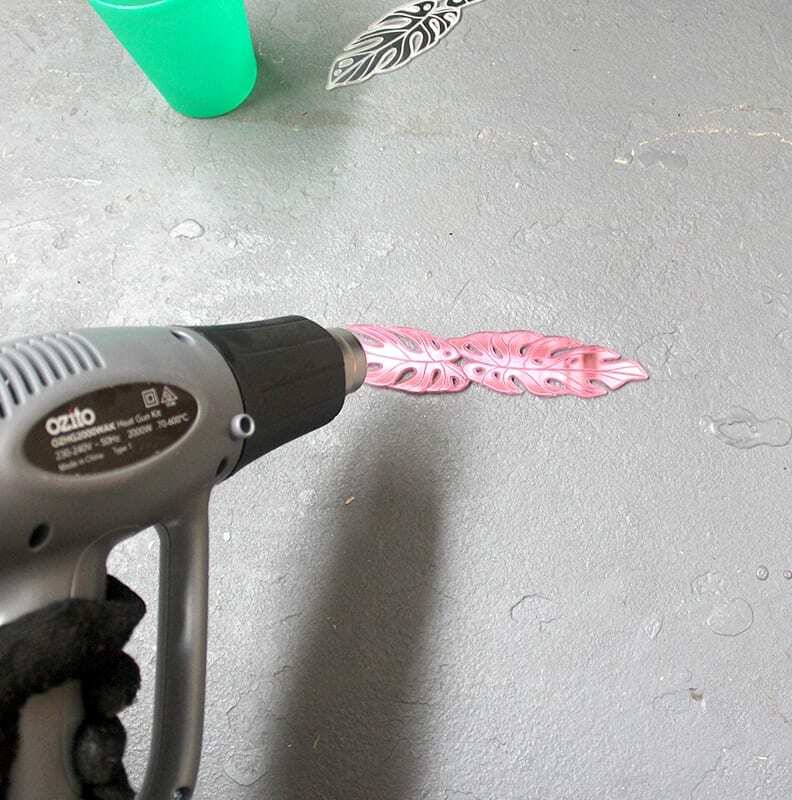 Hold the heat gun over the acrylic and gently wave it over the entire length to heat the piece evenly – holding the nozzle of the gun about 5cm – 10cm away seems to work best. Aim for a slow, gradual heat increase (heating too quickly may cause heat marks). It should take a minute or so. Your acrylic will be ready to bend when you can pick it up and it is floppy. I found that mirror acrylic seems to work best heating from the front, aiming for a slow and gradual increase in temperature. On this piece of silver mirror acrylic, I heated it too quickly and from the back – it caused the mirror layer to go a frosted colour and have small heat bubbles. It still looks quite cool, but not the desired effect. 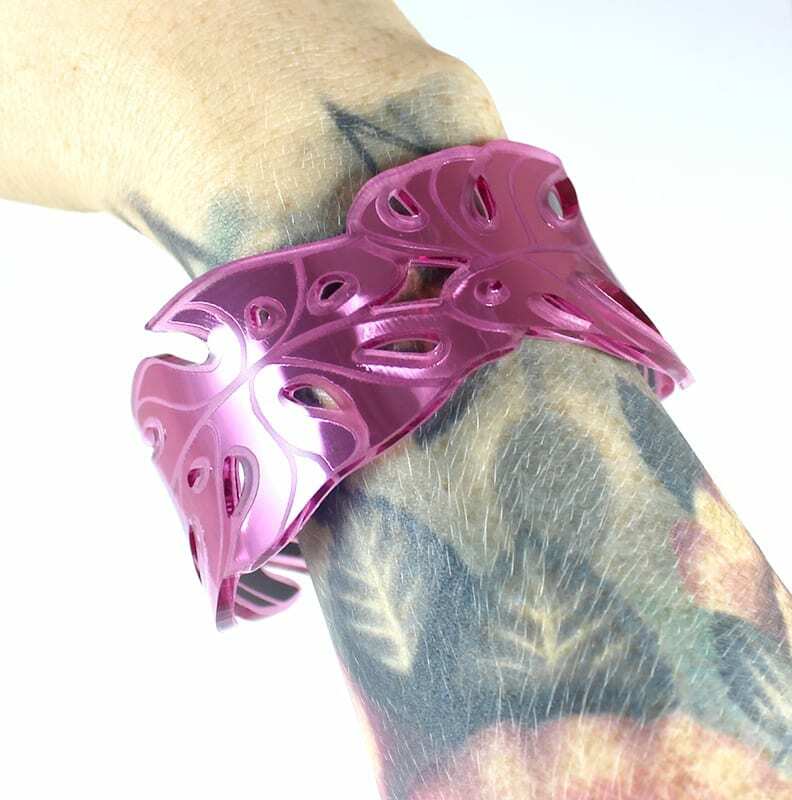 Once your acrylic is heated up to be floppy, you can wrap it around something to mould it. Be careful to make sure the ends curve completely. If your acrylic doesn’t bend completely around your mould, go back to step 1 and start the heating process again. Hold your piece around the mould or in your hands until it cools completely. Once your piece has cooled completely, it will keep it’s new bent shape. Enjoy! 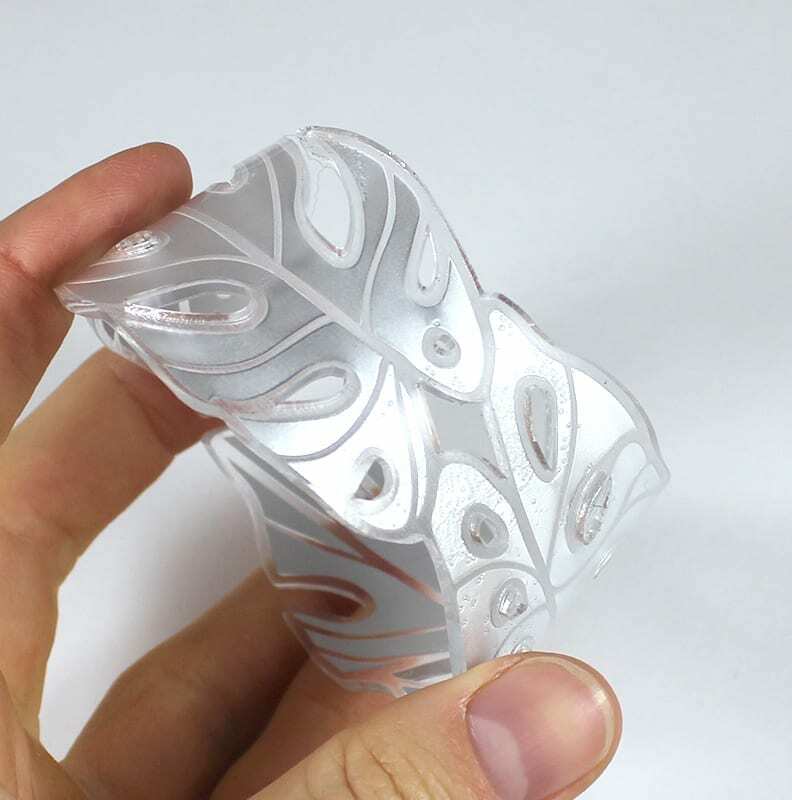 We’ve shown bending here to make a bracelet, but this same technique can be used in any way that you could envision. 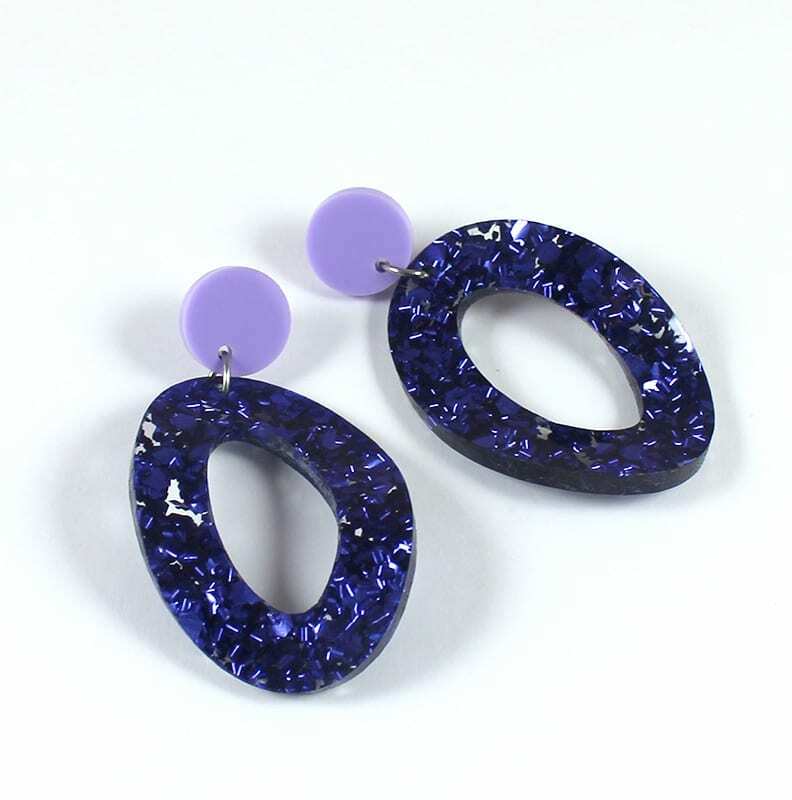 Should here is some simple earrings with a little bend, it really takes them to the next level! 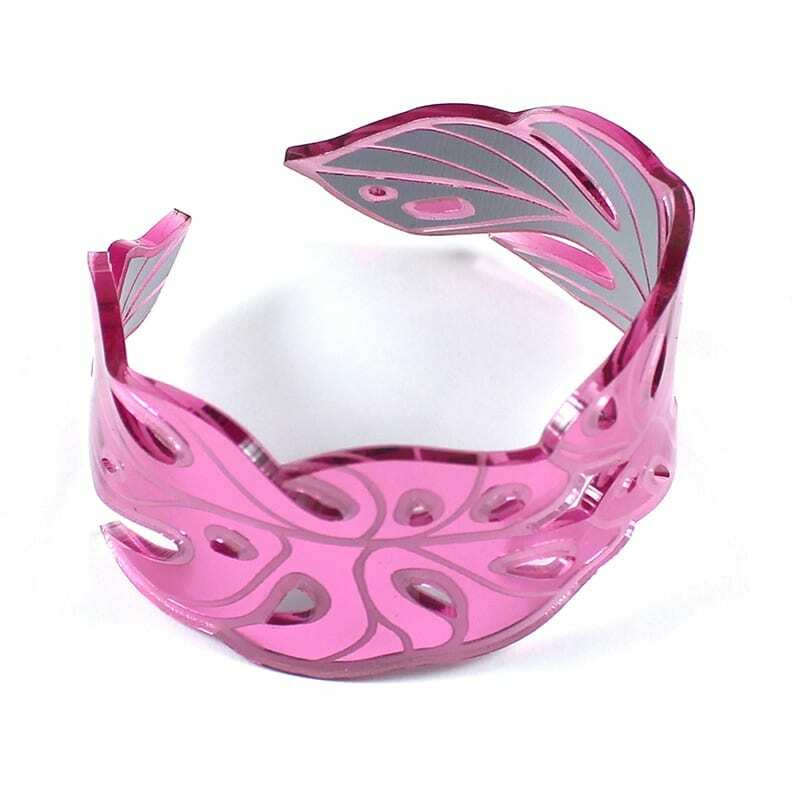 We’ve tried this bending technique with a few different types of acrylic now, and found it quote simple to do. We tried chunky glitter acrylic and found it bent well – the foil pieces gave the surface of acrylic a textured surface. 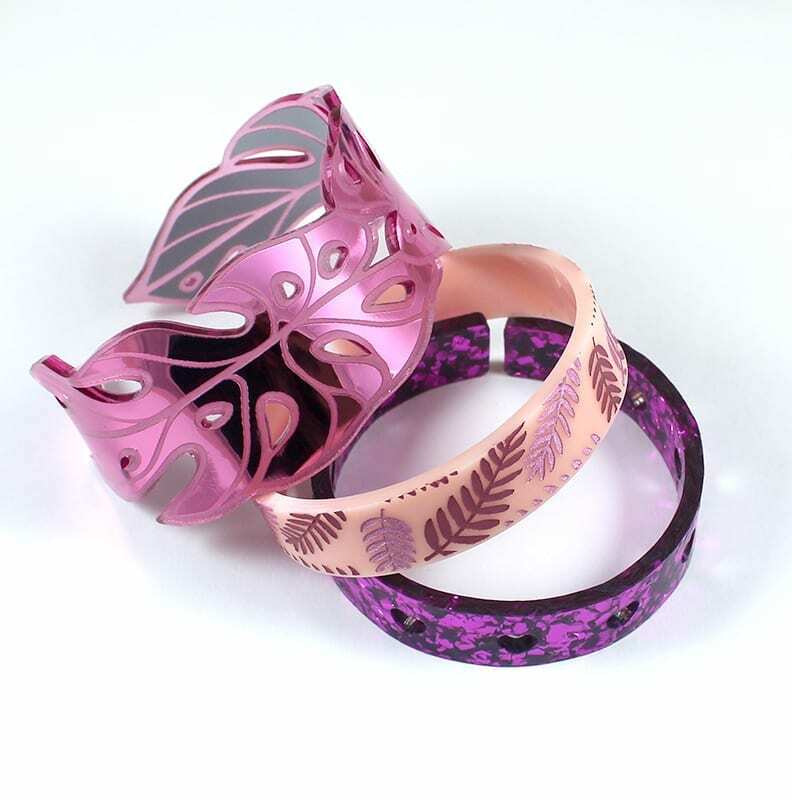 We also tried adding paint fill to an engraved pattern before bending (such as in the pink bangle in the middle here) and it created a stunning result! Share Your Bending Pieces with us! If you follow this tutorial to try bending something, please let us know how you went!  Tag us on Instagram @vectoretch #vectoretch – we’d love to see!